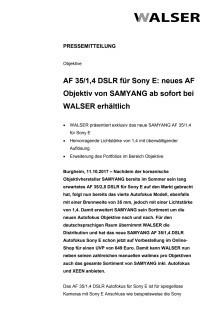 Global optics brand, Samyang Optics is pleased to announce the release of their fourth autofocus lens: AF 35mm F1.4 FE. The bright F1.4 aperture and absolute resolution turn every moment into artwork. This lens now expands Samyang’s autofocus lens line-up to four which includes three existing autofocus lenses, AF 14mm F2.8 FE, AF 35mm F2.8 FE and AF 50mm F1.4 FE.